‘CHRISTMAS WITH T. GRAHAM BROWN’ AVAILABLE AT CRACKER BARREL OLD COUNTRY STORE® LOCATIONS NATIONWIDE | 2911 Enterprises, Inc.
NASHVILLE, Tenn. – Christmas music this year will have a soulful country sound, with the latest album from T. Graham Brown. Fans can pick up a copy of the chart-topper’s first holiday album, Christmas with T. Graham Brown in Cracker Barrel Old Country Store® locations nationwide. The perfect stocking-stuffer is released by Mansion Entertainment and distributed by Sony RED Distribution. The project was produced by T. Graham Brown and Tony Griffith, and is also available on iTunes, and other digital retailers. Brown chose 11 songs, a combination of classic and new tracks, which he hopes will bring the Christmas spirit to friends and fans everywhere. Standout tracks include the feel-good standards, “Have Yourself a Merry Little Christmas” and “I’ll Be Home for Christmas,” which blends perfectly with Brown’s unique style. You’ll find a few up-tempo choices to energize the holiday rush and make you feel like dancin’ and singin’ along. There’s a rockin’ “Run Run Rudolph,” and a fun fantasy tune, “Santa Claus is Comin’ in a UFO,” penned by Brown, his wife, Sheila and their son, Acme. 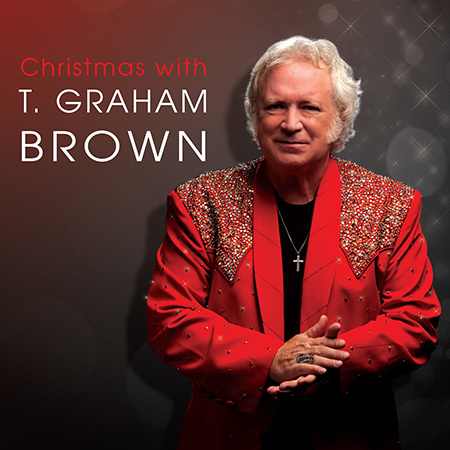 There’s a little “Merry” music for every Christmas music fan on Christmas with T. Graham Brown. The future holiday classic is the follow-up to Brown’s 2015 Grammy nominated project, Forever Changed. The Country/Gospel/R&B collection was produced by Brown and Mark Carman. It features collaborations with some of T. Graham’s closest friends, including Vince Gill, The Oak Ridge Boys, Jimmy Fortune, Sonya Isaacs, Leon Russell, Steve Cropper, Jeff & Sheri Easter, The Booth Brothers, and Three Bridges. The album marked a triumphant return to the studio for Brown, after a 9 year hiatus. It was met with great critical acclaim from the music industry, critics and fans, securing features in Country Weekly, Billboard, CMT and many more.